I admit it. One of the coolest parts of covering the Rockford IceHogs is sitting in the Press Box with the writers and scouts. Often times, the scouts are ex-NHL players. Sometimes I run across an ex-Blackhawk, a hockey legend or one of my old favorites. Such was the case at the last regular season game for the IceHogs, when John Van Boxmeer sat next to me. Van Boxmeer was drafted by the Montreal Canadiens and he played parts of four seasons with that team. In the middle of the 1976-77 season, he was traded to the Colorado Rockies, where he played for 2.5 seasons. He was traded to the Buffalo Sabres, where he played four seasons, before finishing his NHL career with one season with the Quebec Nordiques. He was a big, rugged defenseman, but he wasn't a goon. On the talent-rich Canadiens, Van Boxmeer struggled to get playing time and he asked Scotty Bowman for a trade. Years later, Bowman (who had moved onto the Buffalo Sabres) acquired Van Boxmeer from the Rockies. In the Press Box, professionalism dictates that we are all there to do our jobs. It is always a bit sticky asking for a photo with these ex-players. I would never ask for autographs, but I do try to start a conversation. If it goes well, I ask for the picture. I have never been denied, although I don't ask that often. For his part, Van Boxmeer was extremely nice. He now scouts for the Sabres. 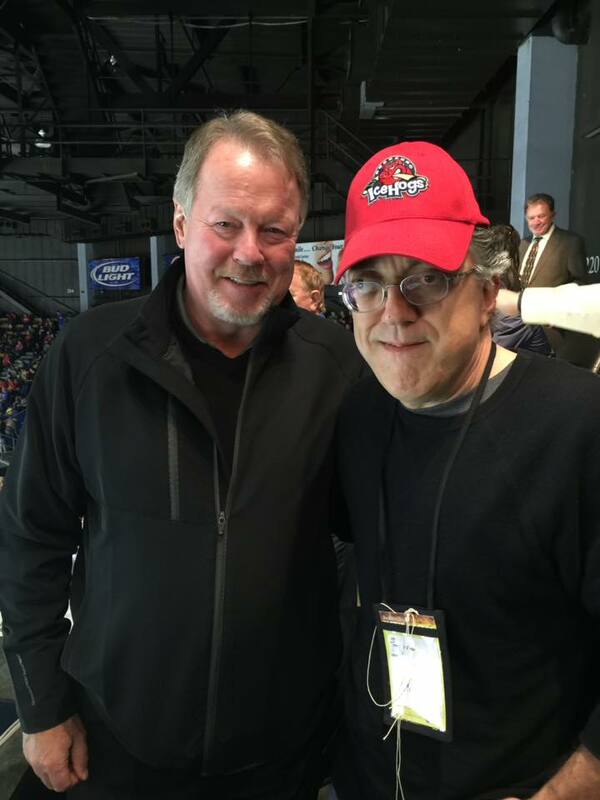 We talked a bit of hockey, IceHogs and Blackhawks. I immediately texted it to a couple hockey friends. My inner hockey child was in full mode. I still remember getting his card in a pack of hockey cards back in the day. Good memories then and a new good memory thanks to the IceHogs. John Van Boxmeer and me in Rockford, IL-April 2016. Sounds like a win-win situation covering the IceHogs .... One day I have to get out to a game!